Who among us enjoys making unexpected trips to the dentist? A toothache can hit us at the worst [possible time, like when we’re planning a big trip or an important business meeting. One way to help prevent this problem is by brushing at least twice daily. But what kind of toothbrush is best for your teeth? The answer comes down to three things: bristles, size, and comfort. Soft bristles. Hard-bristled toothbrushes can damage your teeth’s enamel coating and irritate your gums. It’s best to stick with a soft-bristled product unless your dentist says otherwise. The right head size. The average toothbrush has a head that’s about 1″ long and 1/2″ wide, which is fine for most of us. You may want to try a different type if your teeth or mouth are especially large or small. The ADA seal of acceptance. This is the one essential feature that any toothbrush should have. You’ll find the seal prominently displayed on the packaging. Personal comfort. Last but by no means least, your toothbrush should feel comfortable when you use it. This is a subjective factor, so trust your instincts. 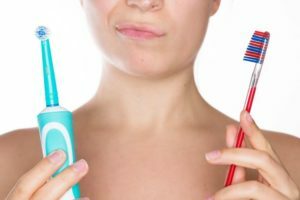 Is a power toothbrush better? Powered toothbrushes have come a long way in the past few years, from the plug-in models of the 1950s to the slim profiles and user-friendly features of the modern era. But whether they’re better than an old-fashioned manual brush is a matter of debate. One exception to this rule applies to people with mobility or dexterity issues, who may find a power brush easier to hold and use. How often should a toothbrush be replaced? You should switch to a new brush every three months or when the bristles on your current brush begin to look frayed, whichever comes first. How long should I brush my teeth? 2 to 3 minutes per session is sufficient for most people. Unfortunately, many of us only brush for a few seconds, which isn’t long enough to enjoy the maximum benefits. Are angled toothbrushes better? For some people, yes. Everyone’s teeth are shaped differently. An angled brush can sometimes get those hard to reach spots that otherwise don’t get the attention they deserve. Your family dentist can advise you further. How should I care for my toothbrush? You should rinse your brush after each use and store it away from other brushes to avoid the possibility of cross-contamination. You should avoid using sealed containers to cover the head, as this can trap moisture against the bristles. When all is said and done, the type of brush you use is less important than the fact that you use it. All of us should brush at least twice a day, preferably after each meal. Taking the time to protect your teeth and gums will lay the foundation for a lifetime of good oral health. There is no better gift you can give yourself, either during the holidays or any time of year. Dr. Jayme Martinez earned his DDS degree from Baylor University School of Dentistry. He has completed advanced training in sedation dentistry and other specialized skills. You can reach his office online or by calling (214) 303-9969.